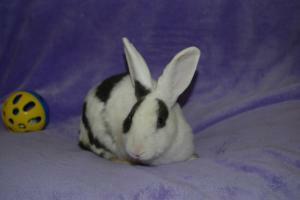 Jimmy was adopted into a loving home to be the companion of another special needs bunny. His new friend lost a back leg when she was small, and as you can see from the picture, the two became fast friends. This darling boy (about 3.5 months old when rescued) is missing a left front paw and some of his leg. We found him just sitting alone in a bottom cage under two other bunny cages. He was just trying to survive, on dirty newspaper with only a litter box, food and water. He was also infected with mites. Cute little fellow. Very Sad situation. Jimmy was rescued by The Haven. After a little TLC by some loving people, Jimmy is doing much better. He is standing upright, using the top of the shorter leg to balance and is such happy fellow. He's even doing quasi binkies. Pretty cute!!!! He is going to a pre neuter appointment soon, so if all is well, he will be ready for the next step. 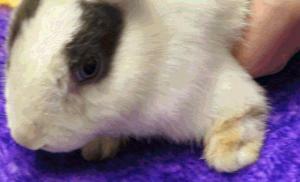 Little Jimmy has become interested in Dee, a girl who came in with a severe eye injury. Jimmy even has a potential adoptive mom in New York- We just need to get him there to his loving parents who want him so much!. We Still have not put together in cabin transport from California to New York.